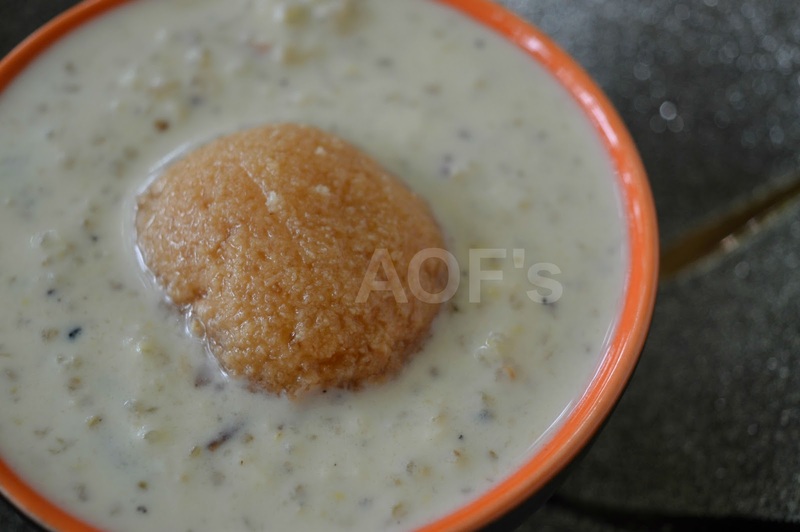 Rice kheer or Chaula Kheeri is one of the most frequently prepared dishes at home. If not for a festival, I find myself cooking some for guests or even on husband's request. And I prefer doing it the hard way. Slow cooked to a rich creamy texture and caramelized flavour, the taste is something just out of the world. But at times, the effort and time required proves to be just too much and I end up with a delicious kheer but a grumpy mood to go with it. That is precisely why I ended up trying to cook Kheer with quinoa as soon as I got my hands on this wonder grain. I wanted to find out if I could save time by doing so and yes, I had guessed it right. 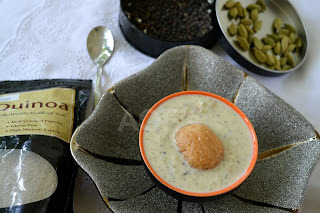 The grains being smaller tend to acquire that melt-in-the-mouth texture quite faster as compared to Basmati rice or even the small grained 'arua chaula' that we use in Odisha. 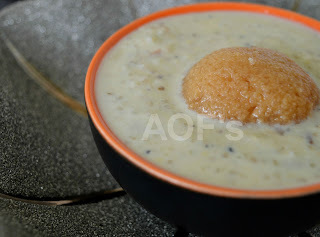 Have not used any thickening agents like milk powder, khoya or condensed milk to keep it as healthy as possible. Quinoa being a superfood, has a high amount of protein, fiber, manganese, magnesium, iron and B2. Apart from the fact that it is gluten-free, it is also one of those food grains that remain non-GMO (GMO stands for Genetically modified and while it may be the only answer to a billowing population and the only hope of abating global hunger, I can't help being scared of what Frankensteins one might be consuming). It is the grain of choice for diabetics as it has a low glycemic index. Plus people trying to lose weight will benefit from eating quinoa as it makes one feel fuller and also takes time to get digested. Preparation - Wash the quinoa under running water. Let it soak for 30 mins. Cooking - Bring the milk to boil in a large pan. Keep stirring it at regular interval so that it does not catch at the bottom and the layer does not form on top. Switch off after boiling for 15 mins and keep aside. Heat the ghee in a pressure cooker. Put about 1 tsp sugar in it and wait for it to turn brown. Before it starts to smoke, add the rinsed and drained quinoa to the pressure cooker. Roast it for 5 mins to give it brownish shade and also to ensure that it's typical smell goes off. Now add 1 cup water and close the lid. Cook on medium flame for 2 whistles. Keep it aside till steam escapes. Add the powdered peppercorns and cardamom to the kheer and give it a stir. Keep aside till it coold down. Serve at room temperature or even chilled.